The Feather Identification Lab has thousands of birds. Although securing a private behind-the-scenes tour of any of the Smithsonian Museums is a fascinating donation, the Smithsonian Institution has two lesser-known research facilities that make for unusual benefit auction items. These work great in the silent auction or possibly the live. 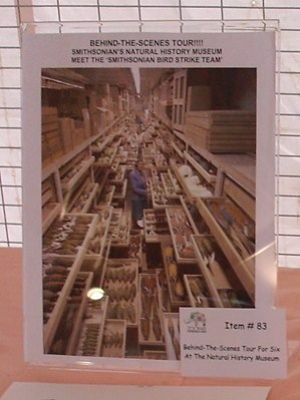 The Feather Identification Lab (jokingly called “CSI for Birds”) of The Smithsonian National Museum of Natural History is one facility. This group analyzes feathers and body material found after “bird-strikes,” the term used when birds collide with aircraft. For instance, when US Airways Flight 1549 landed in the Hudson River on January 15, 2009, it was the Feather Identification Lab which identified the birds as a flock of Canada Geese. The Osteology Lab has a Dermistid beetle colony that draws attention. The Osteology Lab of the Smithsonian Institution’s Natural History Museum is another unusual item. Certainly neither of these labs will be common-place to most guests attending your gala, so if you are reaching out to the Smithsonian Institution or a contact at the facility, consider asking for a tour of one of these facilities. 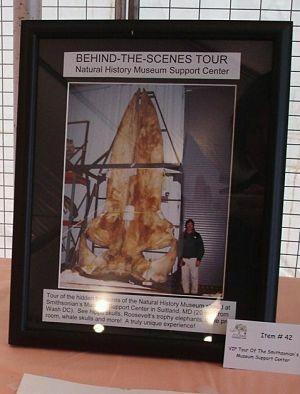 I’m pretty sure that since it is a federal institution that the Smithsonian can’t offer up tours as part of a fund raising event. Those photos are from Zoofari, which is a National Zoo event, which is part of the Institution. They would be prohibited from doing that for an outside organization. Good news – they are! I’ve sold these types of things at other events, too. Oftentimes they are offered by employees.